I’m a cameraman for a fishing show and on a charter through the Kimberly we stopped over at King George Falls during the dry season. The boat ride up King George River from the coast was incredible! The red cliffs were like nothing I’ve ever seen before anywhere in Australia! We got our boat right up to the falls and even got to get out and climb around the rocks at the base of the waterfalls! Of course being careful not to fall in! As this is no place for swimming, our Guide had seen massive tiger sharks and heard reports of bull sharks in the gorge. The falls were still flowing intensely even in the dry, but without the ferocity of the wet season run off. Simply breathtaking! An amazing experience but it didn’t stop there. To the right side of the right waterfall there is a very steep and slightly treacherous track you can climb up that will take you to the top, (if you ever get a chance to do this keep an eye out for the treasure chest half way up full of trinkets and letters, and spend a few minutes to read the tales people have written and leave your mark! ), just follow the track that’s marked with piles of rocks every 30 or so meters..
From the top of the falls you really see the majesty of this phenomenal place! There are water holes to swim in above the left waterfall, but watch your step its over 90 meters straight down at some points! And there are crevasses and gaps in the rocks all over the place that could easily swallow you up! 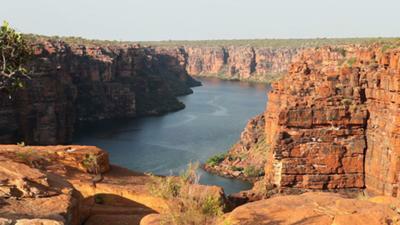 Keep an eye out to for aboriginal burial sites across the tops of the falls too, not much more than skeletons under rock ledges but still an amazing sight. I recommend taking at least half a day if not more to experience all the falls has to offer! An experience definitely worth the effort!!! 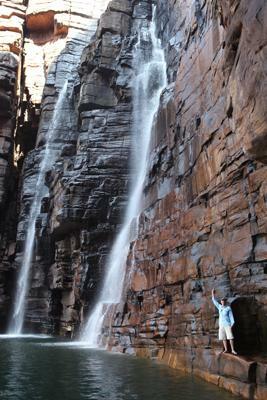 About King George Falls are Awesome!